The Community Forum is a members only area of the WP Site Importer website, which is available to all customers. Here, you can ask questions and get tips and advice from other WP Site Importer customers. To access the Community Forum, please login, navigate to the Account Management Dashboard and then choose Community Forum from the menu. Formal customer support is available to all customers who have an account. This is delivered via a Trouble Ticket system. To access the Customer Support system, please login, navigate to the Account Management Dashboard and then choose Customer Support from the menu. If no Customer Support option is available, please use the Community Forum instead. 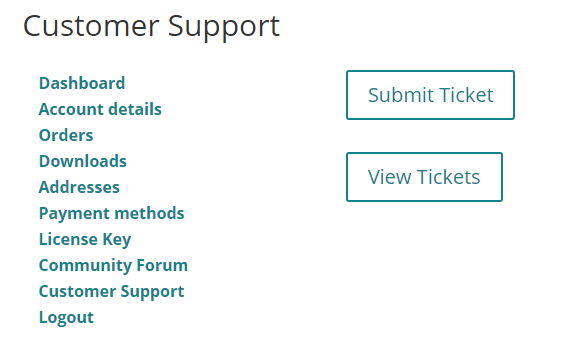 These allow you to raise a new issue with the Support Team or review Tickets you have raised in the past. You will receive email updates as your support request is dealt with.